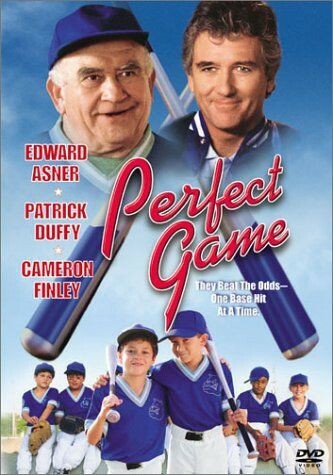 Perfect Game (film) Direct-to-video release by Buena Vista Home Entertainment on April 18, 2000, of a film by Up to Bat Productions. When 11-year-old Kanin gets a new coach for his Little League baseball team, he discovers that the coach thinks him a terrible player, and spends all his time coaching the good players. Kanin and some other “Little League losers” fire their coach, and set their sights on the championship with the aid of Kanin’s mom and a retired high school coach. Directed by Dan Guntzelman. Stars Ed Asner (Billy Hicks), Patrick Duffy (Bobby Geiser), Cameron Finley (Kanin), Tracy Nelson (Diane), Drake Bell (Bobby Jr.). 99 min.